Another wet and gloomy Monday brightened by Book Journey‘s ‘It’s Monday! What Are You Reading?‘! As you may well have noticed if you’ve stopped by recently, this past week I participated in the Frightful Fall Read-A-Thon. It was a great way of ‘meeting’ other bloggers and it was wonderfully hosted by Michelle @ Castle Macabre. What have I read during the past week? Most of Dracula by Bram Stoker – I only have a few nail-biting chapters to go so I’m planning on dashing off after writing this to finish it. You know, so that I have plenty of time to repress it before I have to sleep! What am I currently reading? Yep, still Dracula! 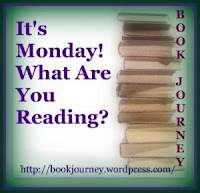 What am I planning on reading this week? I have The Way of Shadows by Brent Weeks loaded on to my eReader and ready to go. That is definitely my first priority! Hanna @ Booking in Heels (whose blog is a MUST follow!) reviewed the last of the Night Angel trilogy yesterday and, seeing as I trust her taste in books implicitly and apparently am doomed to just follow her reading path, had no choice but to buy the first! After that, I’ll probably just move right on to Shadow’s Edge by Brent Weeks. I’m predictable like that!